New Book and New Cover! I have a new book releasing soon! I’m really excited about it, can hardly wait to share it with my readers. I suspect I could burble on happily for paragraphs. But I won’t. I wouldn’t want to live in the Chateau de Montbrun (or its analog in my North-lands, the Tour Nileau). But I’d love to visit for a week! Imagine waking up in a four-poster and getting out of bed to watch the sun rising through the window in the massively thick stone wall of the castle. Climbing a spiral stair to the battlements to get some fresh morning air. Looking out over the beauty of the countryside from that vantage. This bed (right) in the fifteenth-century country house of Kingston Lacy has the feel of the one I imagine my heroine Lealle sleeping in. Although the walls of Lealle’s room would be the whitewashed stones of the castle, not tidily papered plaster! An early scene in A Talisman Arcane transpires in Lealle’s room. She wipes the mud from her little brother’s shoes, so that their mother won’t know that he’s been playing in the park with a friend despite strict parental prohibition. Here’s a floor plan showing the castle’s bedchambers. I suspect that Montbrun (the model for my Tour Nileau) must have been quite uncomfortable to live in during medieval times. 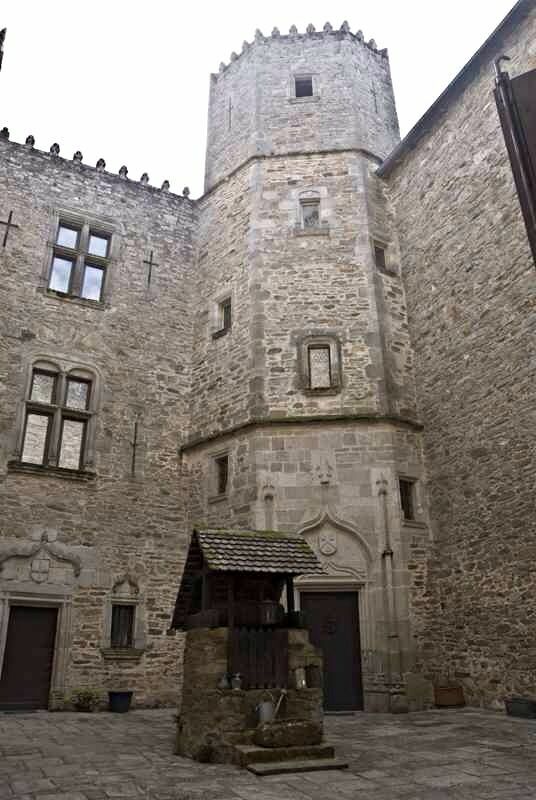 Heavy stone walls, huge (cold) rooms, few windows, drafty garderobes, and so on. But Montbrun looks to have been newly modernized for this century and our world, just as the living quarters of Tour Nileau were made comfortable—even luxurious—by the mother of my heroine Lealle, in the nineteenth century of my North-lands. In an early scene from A Talisman Arcane, Lealle mentions the main dining hall, where her parents entertain when they hold gala occasions in their home, inviting hundreds of guests. But Lealle dines in the ‘small’ dining room with her family that evening, not a cozy place, but certainly less imposing than the larger space. Of course, neither the Palacio Real de Madrid nor Chatsworth House (both above) are quite right as representations of my Tour Nileau. The rooms where Lealle and her family live have been repaired, had windows added, and been furnished with ‘contemporary’ appointments (contemporary for the North-lands nineteenth century), but they still retain their essential medieval structure and character. Here’s the floor plan showing the dining rooms and parlors of Tour Nileau. Tour Nileau, as presented in A Talisman Arcane, shelters three disparate functions within its massy walls. The most prominent one is the Court of Audire, in which serious criminal charges are heard and tried—those of assault, murder, and injurious magery. Because the castle is so old, it is recognized as a site of considerable historical significance. Thus it is opened at regular intervals to visitors wishing to tour the building. The ground level and the first floor above it are the areas of most interest to legal scholars and aficionados of Pavelle’s history. The family quarters on the second and third floors are rarely made available to the public. The castle’s great hall is a vast uncomfortable space, and the chapel (unused for religious services at this time) isn’t much better. Lealle’s father is very fond of the library and its annex, both filled with legal tomes, and both well maintained. Here is the floor plan for the historically interesting first floor. Lealle Meridar, the teenage heroine of A Talisman Arcane, is the daughter of a High Justice of Pavelle. Her father presides over the most difficult matters of law arising in the river town of Claireau. As High Justice, he lives and works in a medieval castle made available to he who holds that office. I modeled the Tour Nileau after a real castle in France: Montbrun. Montbrun has been modernized, so that a family of our twenty-first century could live there in comfort. In my story, I’ve taken liberties with many details, so as to make the building fit the nineteenth century milieu of A Talisman Arcane, and possess the working spaces needed by Lealle’s father. We first see the Tour Nileau through Lealle’s eyes, when she pauses on a bridge upriver from her home. Our next view is of its central court, when she passes under the raised portcullis. I wasn’t able to find a photo of the courtyard that I could feature on my blog, but if you are curious, check this link. Here is a plan of the ground floor. Lealle goes straight up to her bedchamber via the main spiral stair when she first arrives home. But near the end of my story, she has a very important discussion with her father in his chancery. Yes, I dove into brainstorming the title for Lodestone Tale 5 one. more. time! I figured the reason I couldn’t settle on any of the titles I’d considered was because none of them were right. It wasn’t that I’d asked too many people for their opinions. (Although maybe I had asked too many.) No. It was because I agreed with all of their objections. Even though the concept of the labyrinth appears again and again as a motif in the story, it is not the heart of the story. Lodestone Tale 5 is about courage and kindness far more than it is about discerning the reality behind tricky turnings. Neither is the story really about a legacy. Yes, two legacies feature in the novel, but that’s not what it is about. Furthermore, the word “legacy” has a weight to it which is all wrong for the story, which filled with hope, victory, and rebirth. “Legacy” does not feel dark to me, but it does feel weighty. I have come to really like the word “Talisman” in conjunction with my story. Talisman is right! But “Reach” is not. Even if no one would mistake it as referring to a feature of the landscape, it is still wrong. Yes, each of the lodestones in the Lodestone Tales has a long reach through time, but that’s a feature of the series. This individual story is not about that long reach; it’s about what happens between Ohtavie and Lealle. The scope of “Reach” is wrong. For several days, I thought this was THE ONE. The book starts off with teenage Lealle trespassing. Lealle herself is not so sure that she does so innocently, but I think the reader will be pretty clear on that. Later in the story, we learn that Ohtavie has also trespassed, also innocently, if not so innocently as Lealle. When I wrote this story, I’d envisioned it as a standalone. But all of my early readers have requested a sequel to it. My first answer was, “No. Sorry.” But by the time the 4th request arrived, I found myself having ideas for an entire series. I grew excited about what I might do in Book 2, Book 3, Book 4, and Book 5. Because Lealle is the daughter of the High Justice of Claireau, there will be an awareness of the law present all the books. (Yes, I am going to write them.) So titles referencing aspects of law would be a fun way to go. Innocent Trespass would follow that theme nicely. But. But. But. Lodestone Tales 5 is very much a fantasy novel. It is not a thriller. It is not a legal thriller. It is not a mystery, although there are elements of mystery within it. Innocent Trespass does not say fantasy. Reluctantly, I loosed that choice from my grip. I revisited this question. I needed to stop devising titles that were accurate, but misleading in their focus on a tangent. The heart of my story is the idea that we redeem each other. Even within our mistakes, there is opportunity for us to save one another. Is there some thing or place or person in Lodestone Tales 5 that embodies my theme and that can serve as the anchor point for its title? Lealle is central. She stumbles upon the first person she decides to attempt saving, but then through choice goes on to save another chance encounter plus an entire townful of people. One salient characteristic about Lealle is that she is her father’s daughter. “Daughter” would be a good word to have in my title. Place did not feel specifically important to my theme. Yes, setting is always important in a story. The people would not be who they are, if they lived elsewhere. The events would fall out differently in a different setting. But, for this story, place was not nearly so important as the action of trespass and the complication of the talisman. I had three words that felt central. Daughter. Talisman. Trespass. It occurred to me that C.S. Lewis’ Narnia Chronicles include quite a few of the possible structures. What if I used them as guidelines? Well…maybe. But, no. I tried a few variations. The Daughter and Her Trespass. Talisman’s Challenge. The Talisman Legacy. The Talisman Secret. A Talisman Unsought. Wait a minute! That last was definitely not right, but it had the same structure as A Legacy Arcane. What if I pulled “Legacy” out, and replaced it with “Talisman”? The talisman is definitely secret, mysterious, and understood by few. It is arcane. But unlike the weighty word “legacy,” talisman has a lightness to it. It breathes of hope and trust. Lucky pennies are talismans. We keep them for luck, for good fortune, in the hope of a bright future.